Photographing flowers tends to fall into macro-photography. Close-up subjects with a very shallow depth of field. 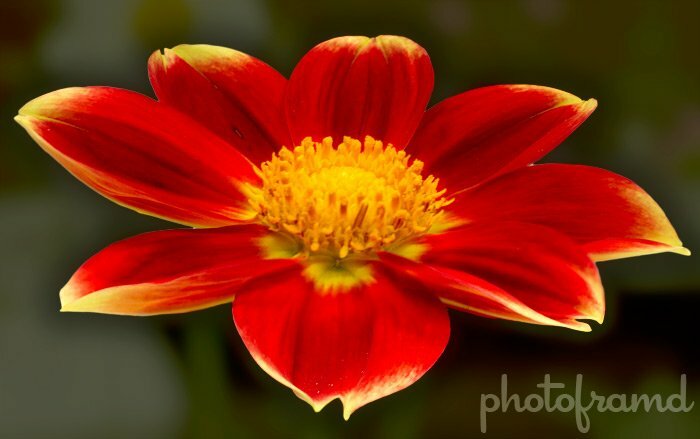 Suppose you want to photograph an entire flower? A direct shot with the subject flat in the focus plane will work; just be sure to extend the f-stop to around f/5.6 or f/8 (and experiment). But, what if the flower is angled like the one above? A Tilt-Shift lens would work, again with experimentation. There is another way – shoot several images and use Photoshop CS5’s Photomerge to assemble them. 1. Camera set-up with the Canon 7D. For this photo, I studied the flower very carefully. The dahlia was at a flower show, so a tripod was not allowed. The flower also could not be moved, so I had to work with the existing set-up and lighting. If you look at the above photos, you can see how I planned the focus zones for each photo (indicated with the blue outline). 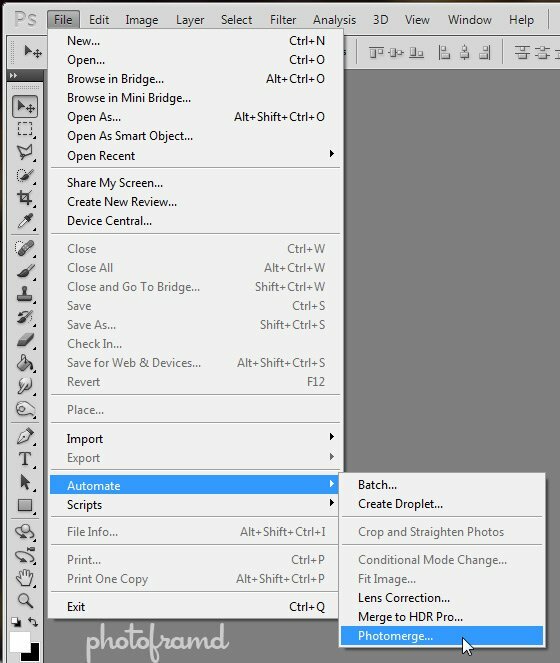 Photomerge in Photoshop CS5 is hidden under File > Automate > Photomerge. 3. Add the Raw files in consecutive sequential order to Photomerge. Photoshop requires that the photos be related in consecutive sequential order. (If not, renumber them before you start this step.) Add the files using the Browse and click OK to start the process. 4. Change the Auto-Blend Method to Stack Images. I have tried this several times with different sets of images. Photoshop CS5 assumes that you want to create a panorama, but what you really want is a Stack of Images. 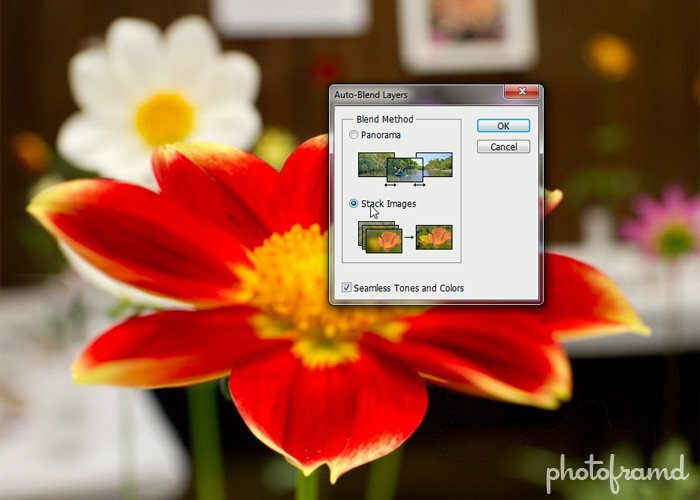 You can change the Auto-Blend Layers Method under Edit > Auto-Blend Method. 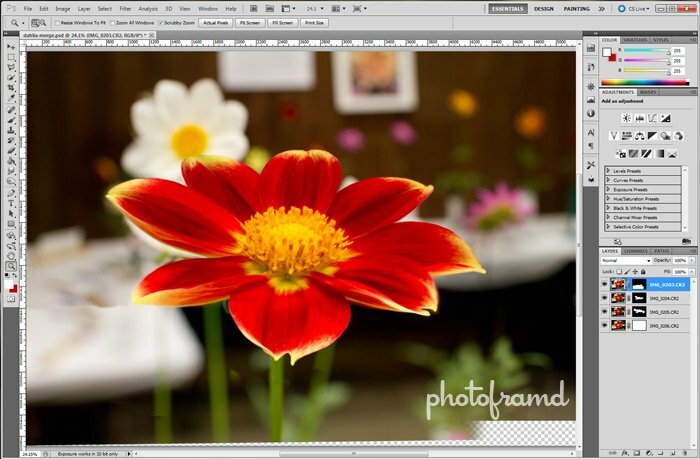 Photoshop does a great job at aligning the details of each image even if they are hand-held! Photoshop will even balance the exposure of the images so that the image looks balanced. Unfortunately, if you look at the above image, you can tell that the end result needs manual adjustment. 5. Fixing each Layer with Masks. 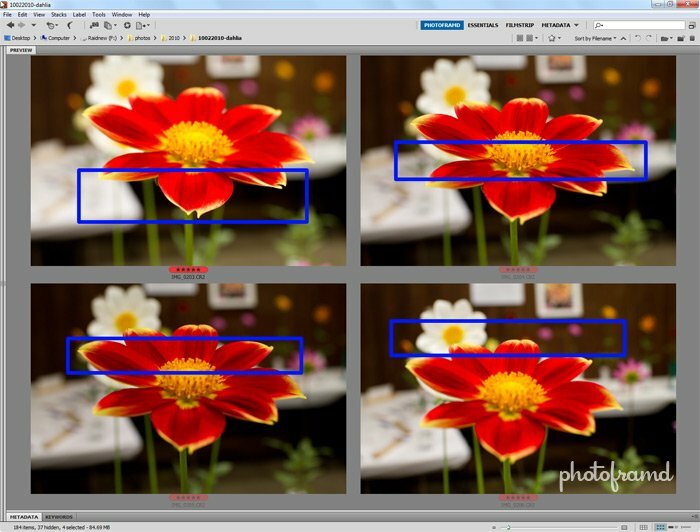 Photomerge will place each photo on top of each other with the details properly aligned. The displayed portions are controlled by masks on each Layer. To get the best image, you will need to go through each layer revealing the sharpest parts (painting in white on the layer mask) while hiding the softest part (painting in black on the layer mask). You will also need to be sure that there are not gaps in the layers. This will take time and effort, but the final results are excellent, with sharp details from petal to petal. Now, you may have heard about a program called Helicon Focus. When Photoshop failed to pull the sharpest parts from the set of images, I tried this program. Unfortunately, Helicon Focus requires the images to be exactly the same with the only difference being the focus. Translation – photos must be shot with a tripod! Hand-held photos will not work with this program. Photomerge in Photoshop CS5 does an excellent job aligning the details from a series of photos. Even hand-held photos are not a problem. Just be prepared to spend some time fixing the layer masks. But, the depth of field created in the final macro image is well worth the effort! NOTE: I just had an interesting chat on Facebook with one reader. I intentionally used a non-macro lens for this tutorial. Not many people buy dedicated macro lenses unless they can justify the expenditure. Don’t ever let not having the “right” lens hold you back. Just be creative with what you have and get that photo! I’ve had great luck in the past letting Photoshop do the alignment. I have used the “load images as stack” followed by the “auto-align images” then cropping the resulting stack and finally exporting stack to files. Unfortunately the way this works there is no way to automate it. 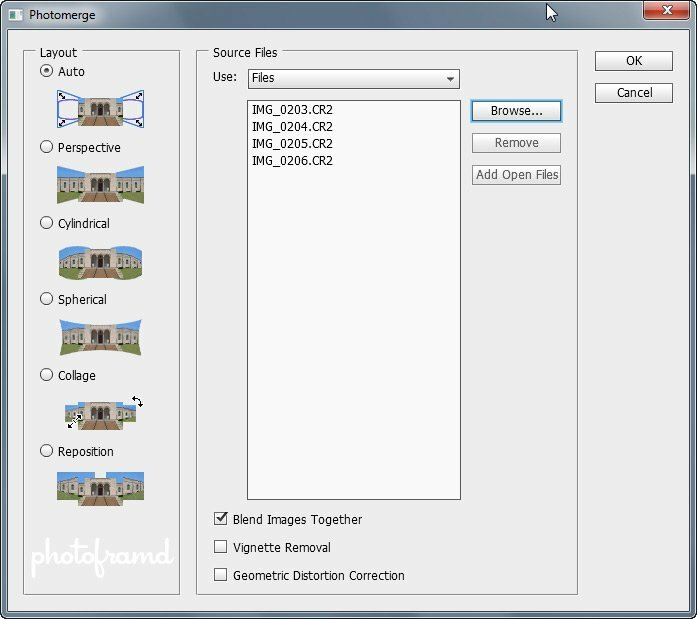 However, you can automate it if you use the Photomatic batch operation choosing to only align and crop images. Way more automatic and easier than Photoshop. Maybe that would work for you for Helicon whith handheld shots. I tried a couple of methods with Helicon and could not get it to work with the hand-held images. From looking at the documentation, it wants the only change from photo to photo to be the focus. Plus, Helicon Focus tries to hook you into an annual “update” subscription. Arrgh, annual update, way too expensive, unless you make a living using it. I have gotten good results turning hand-held into super well aligned photos using both Photomatix batch align and Photoshop auto-align. Might want to keep that in mind if a use for that type of thing comes up in the future. Thanks for your tip on merging images in different focal planes. Unfortunately, I am confused on how you go from step 3 to 4. When I am in the window of 3 the only way I can go to 4 is to close 3 first. Now I am out of the merge function. Are you using CS5? After clicking OK, Photoshop works on the files and once complete it displays the merged composition in the main window. At this point, you can change the Auto-Blend Layers Method to Stack Images.